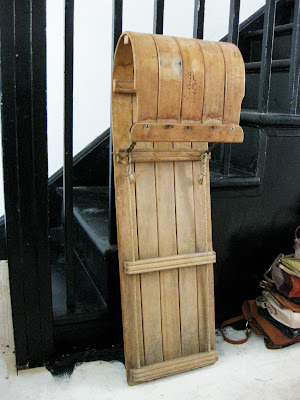 elaine ho: ever wondered what 53 vintage purses on a wooden sled looks like? 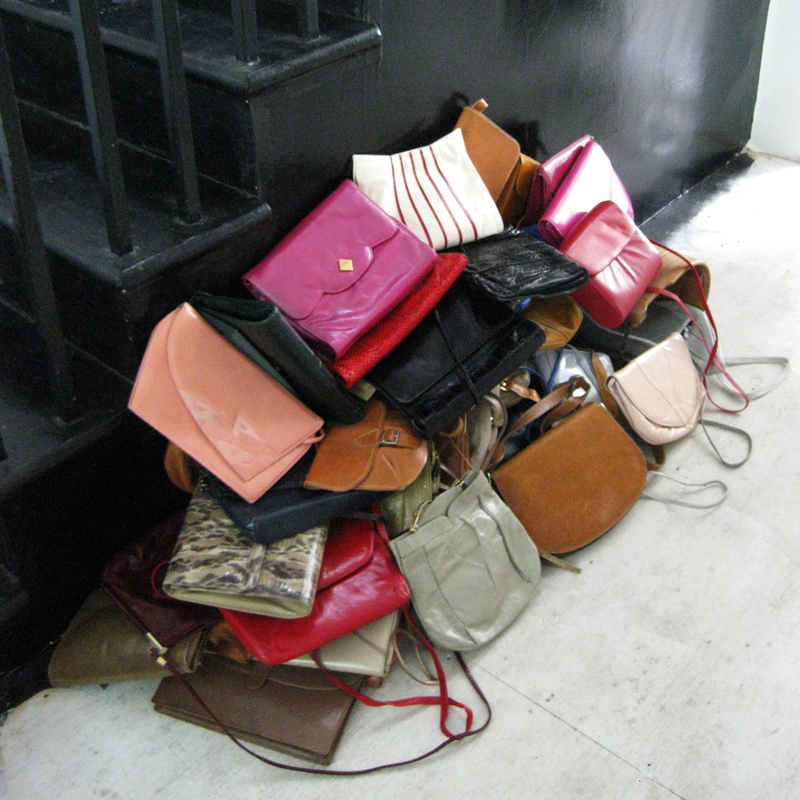 ever wondered what 53 vintage purses on a wooden sled looks like? i thought yesterday was a pretty fulfilling day when i managed to pick up a small vintage wooden sled for a super good deal. it was such a good deal, i would have been losing money by not buying it. it's cute and small had a nice patina, i can't wait to clean & oil it. 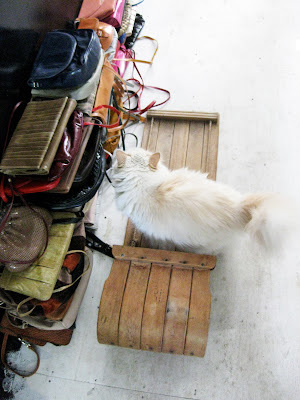 i was thinking of attaching it to the wall for a shelf or decoration and brenden suggesting attaching it to the wall for a floating CAT PERCH! so this afternoon i went for a quick break before starting to sew up a shirt sample. the break turned into an epic thrifting living dream. you know the reoccurring dream where the thrift/charity shop is sooo good you wish you had about 6 more arms (8 in total) so you could get your hands on all the good stuff, but then your cart is getting so full that all your great finds keep falling out and there's just an endless supply of really amazing things and you don't want to miss anything, but then it's so hard to concentrate because EVERYTHING IS GOLD? and then your hands are shaking, you have heart palpitations and you're trying not to show you're too excited so they don't jack up the price because they realize that you realize the real worth of the stuff and you're just about to soil yourself with just the though of the amazing haul you're about to score? anyway, I JUST LIVED IT! FOR REAL! i got 53 vintage leather purses in pristine condition, 11 beautiful vintage leather belts and some other random stuff. i could not shove stuff into my cart fast enough and purses were falling out everywhere. it was sooo hard not to freak out. I'M FREAKING OUT!!!! i think i'm going to skip the gym this week because i had to take three wobbly trips on my bike to bring everything home. this is what it looks like: 53 vintage leather purses on a wooden sled. an innocent bystander asked me what i was planning to do with all my purses and his friend told him i looked like an artist, as if that alone made it reasonable for one person to buy 53 purses. while i was biking away with the last load of purses, i told him they were ALL FOR ME, to which he replied: "CALISSSSSSE!!!!"